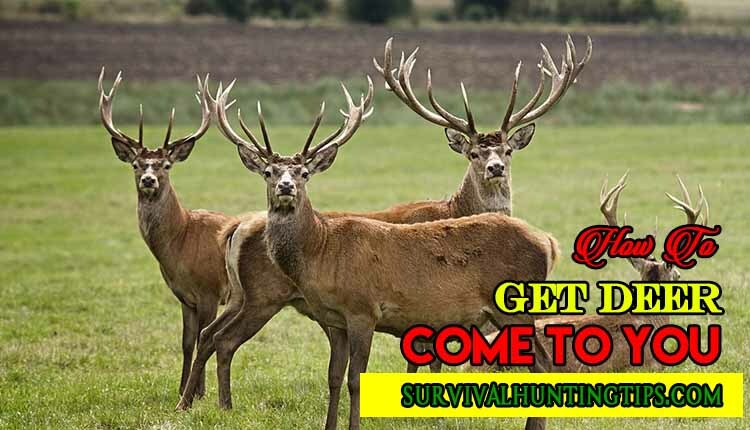 There are several tips online explaining How To Get Deer Come To You. But, how many of them are practicable? Attracting deer to a specific area is usually done for hunting or viewing purposes. In any case, there are many different ways to do it, as long as you know the laws in your region. We have certain aromas, foods, and plants that attract deer. By incorporating different techniques, you can bring droves of deer to your property naturally. The best way to attract deer and other animals to your property are to maintain a deer-friendly habitat. Conversely, when done correctly, you will have provided the deer with an ideal location to feed, live and roam. Not only will you be able to attract them to the region, but they will continue to come back for years to come. Perhaps you might say: “…but deer are averse to human and can detect human presence while being a few meters away.” We will attempt to answer your question in this article by giving pragmatic tips containing steps and instructions on How To Get Deer Come To You. Your purpose of researching on How To Get Deer Come To You could be for backyard viewing or photography, as well as for hunting purposes. Deer are naturally cautious creatures. However, they move into an area to feed, especially during the fall and early winter months. In addition, when they are gaining weight during the winter, it is possible to attract deer with natural foods. Select a location for which you want to attract deer. Determine an area where there is enough fence coverage that will allow deer to be comfortable. Choose a place that is far from other animals and most of the noise. Obtain a bag of cracked shell-less corn and seed from a feed. You can get these in agriculture or sporting goods store. Clean the area where you want to attract the deer too. You can use the feet to push the leaves and sticks aside or use a hand rake to clean the bare floor area. Spread the corn out throughout the area. Disperse the corn so that it is easily accessible by more than one deer. Pour one or two small piles of corn, to hold them in the area for a longer period of time. Deer are naturally nervous creatures that usually try to avoid contact with humans. They either freeze or bolt when scared. As a result, you have to resort to watching them from a distance in most cases if you do not want to scare them away. If deer are common in your area, you may be able to attract them to your yard so you can observe them. Place a deer feeder in your backyard. It should both be visible from a window and far enough from the house. This is to prevent the deer from easily freaking out. Fill the feeder with grains or fruits and include fresh water. Add a pinch of salt near your feed as this also often attracts deer. Leave a glob of peanut butter near the feeder as many deer enjoy its aroma and flavor. Keep your garden as quiet as possible. A television, radio or a barking dog can make all the noise enough to keep the deer away. Deer are more likely to feel comfortable in a garden with trees and foliage than many areas that are out in the open. This section teaches you the details on How To Get Deer Come To Your fast stream. It includes the things you need, how to create the food intrigues and how to create the deer-friendly environment. Keep the food parcel at least 1 mile off the roads. The food tracing area will need natural cover so that the deer will feel safe. Remove all the leaves and debris in the area you are going to place the food. Disperse the food into the area you have just cleared. Refrain from stacking the diet in the center. Sprinkle the raw salt on the diet. Place the halves of apples and acorns around the area near the food parcel. The scent of apples will attract deer to the plot of food. Apply doe scent on the outside edge of your parcel of food. This will attract deer to the area as well as mask your smell. A deer-friendly environment must possess deer-friendly plants, shrubs and trees. Having an area filled with Dutch white clover, purple oats, corn and other forage species will naturally attract deer to the area. Keep the dogs away from the area. Dogs hunt deer and prevent them from returning to your area. Abstain from mowing or removing vegetation in the area. You want to keep adequate coverage for the deer. Deer feeders are often used by hunters and nature lovers who want to attract deer to their yard. Corn feeders – whether for deer or squirrels – will naturally attract deer. However, if corn is plentiful in the area, you may have some additional tricks to encourage the deer to come to your feeder. Plant a diagram of the food by the feeder. The plot should include a variety of natural foods that the deer eat, i.e. soybeans, alfalfa, clover or corn. Provide drinking water. This can be especially difficult for deer to find during periods of drought or during the winter months. Make a salt stone, which is especially attractive to deer during the spring and summer months. You can do this by using special salt such as granular or sea salt, formulated for deer. Place the salt in a trough that deer can easily access. Use liquid sweeteners, such as sugar cane, molasses, corn or maple syrups. Pour the liquids over any provided food. You can also create a separate feed channel. Deer feeders may be so clogged by sugary products, such as syrup. Hence, you should check with your state to make sure it is legal to feed the deer at certain times of the year, or not at all. Some states consider feeding deer for “bait” hunting purposes illegal. Deer have a strong fondness for clover. There are two types of clover that you can plant to give deer different nutrients: red clover and white clover. These clover species are easy to grow and contain high levels of protein. White clover can grow up to five years from a single seedling. Red and white clover seeds are not hard to find. Alfalfa is another favorite for deer. But, to grow it, it can require high maintenance that requires monitoring for weevils. These pests and other insects are controllable with organic pesticides. The plant grows best on fertile, well-drained soils which must have a pH of 6.5 for the seeds to grow properly. Chicory is a perennial herb that deer like to graze on. It provides sufficient feed forage for spring and summer. It’s a drought tolerant plant with the help of its long taproot. Ryegrasses are different from the rye. While rye is a cereal, rye herbs are fresh season grasses. Ryegrasses are very rich in protein. They are highly digestible, grow quickly and have a long growing season. Rye grows faster than legumes, which makes deer graze heavily on it before legumes grow in the spring. Applying certain methods of using food to attract deer may be illegal in your state. It is illegal to bait a deer with corn, pellets, minerals or game salt in many states. You don’t want to get put away for learning How To Get Deer Come To You. By following the tips, realizing How To Get Deer Come To You is more easier than you might have thought. The tips mentioned in this tutorial are the combination of working ideas which you should also try. Did you enjoy the tutorial? Were you able to comprehend? We hope you’ve learned How To Get Deer Come To You. Or maybe you might want to go through the details again! Kindly let us have your thoughts on the article in the comment section. You should also share the article if you like it.